This area of France is a great venue for cycling. The roads have much to offer for the serious cyclist as well as plenty of smooth even routes and many quiet lanes for families and new cyclists. This article helps explain why rural Normandy is a cyclist's dream. In Calvados there are cycle paths and green ways developed over the last few years which provide safe paths for people to cycle as much or as little as they like. 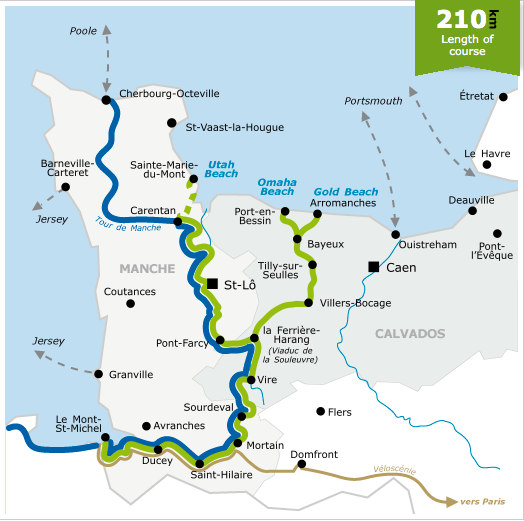 This is the link to the French site dedicated to the cycle paths in Calvados and there are specific cycle tours from the Normandie Tourism Board here. All the routes around Domaine de la Hamberie are suitable for cycling but a special green route has been created along an old trainline nearby. The route of a train line used to run from Damblainville to Falaise and is seen here in red and white. This has been converted into a Voie Verte which is a great way for the family to cycle into Falaise. There is a lovely route to the starting point in Damblainville from Domaine de la Hamberie too, but if you prefer to drive to the starting point, there's plenty of parking there too. The route is about 7 kilometres long, and here is a link to the website for this green way. Calvados General Council has created a pdf document with 12 detailed maps of cycle routes in the area (including our local one in Falaise). Please see the brochure here. It's all in French but the maps are great and really shows the possibilities for a great cycling trip here in Calvados. D-day landing beaches-Mont-st-Michel cycle route. This unique véloroute, or special cycle path, links two of Normandy's most iconic sights. It starts at the D-Day beaches, where the Allied troops famously landed in June 1944 in order to overthrow the German forces occupying France. It then takes you west to the glorious vision of the Mont St-Michel, the famed island crowned by a stunning medieval monastery. The route allows you to explore the two Normandy départements (or counties) of Calvados and Manche. Immerse yourself in the typical Norman atmosphere of this exceptional cycle path, which takes you along via beautiful, now-tranquil hedgerows, hills and valleys. FreeWheelingFrance.com has a great page dedicated to this route here.